Stroke Ball Spline | Products Lineup | Products | NIPPON BEARING CO., LTD. 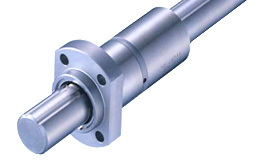 The NB STROKE BALL SPLINE SPLFS type is a high accuracy linear motion bearing with a limited stroke, to which both radial load and torque can be applied at the same time. It operates with extremely small dynamic friction. The NB STROKE BALL SPLINE consists of a nut and a shaft both with raceway grooves. The flanged spline nut consists of an outer cylinder, a retainer, side-rings, and ball elements. Since the retainer in the nut is equipped with ball pockets, the ball elements do not contact each other, which allows for a smooth linear motion. The stroke is limited since the retainer is a non-circulating type. For normal operation, it is recommended to consider 80% of the maximum stroke shown in the dimension table as an actual stroke length. The rolling elements are separated by the ball pockets so that they do not contact each other. The stroke length is limited, but extremely small dynamic friction and low noise are realized because the rolling elements do not circulate. Since all the components are made of stainless steel, this stroke ball spline has an excellent corrosion resistance and heat resistance (operating temperature: -20 to 140℃). It is ideal for clean room or vacuum applications. With the nut about 20% smaller than conventional ball splines, it contributes to space saving. A lubricant groove and two lubrication holes are provided on the outer surface of the nut, which allow for an easy designing of lubricant replenishment.